One “alternative” idea touted recently is for parents to essentially bribe their children, depositing money into a child’s bank account as a reward when they eat vegetables – an idea actually backed up by research. A US study in 2016 showed that the technique continued to encourage primary school age children to eat their greens for up to two months after these incentives were stopped. Children who were incentivised for a longer period of time were more likely to continue eating vegetables after the deposits ended too. And monetary incentives can actually decrease our motivation to perform the activity we are paid for, and eventually we lose interest. So, even if bribing kids with cash to eat their greens works at first, it is not sustainable in the long term. Non-monetary rewards aren’t much better either. The phrase: “You can have dessert as long as you eat your sprouts”, will ring a bell for most people. This, though said with the best intentions, may increase the intake of the target food in the short term, but can convey the wrong message to its recipients: “This food must be really bad if I am getting something for eating it!”. It not only places dessert as a food of high value – a trophy that is earned – but also teaches kids to dislike the target food. A familiar sight for many parents. So what can you do instead? First and foremost, start early. Formation of food preferences start in the womb, and the first months of life are crucial in developing eating habits. The older children get, the more exposures they need to a novel vegetable in order to consume it. Which brings us neatly to the next point. Vegetables must be offered frequently, without pressure – and you mustn’t get discouraged by the inevitable “no”. Even if you have missed the first window of opportunity, all is not lost. 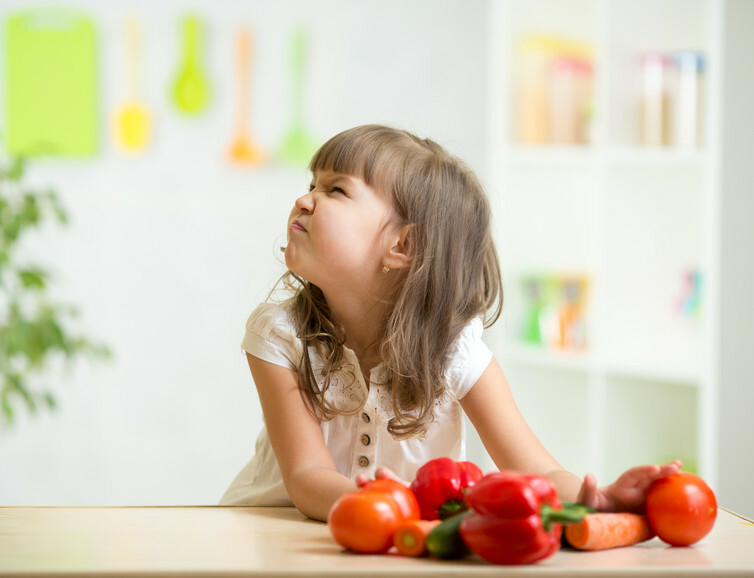 Parents can lose hope after offering the same vegetables between three and five times, but, in reality, toddlers in particular might need up to 15 exposures. Likewise, don’t draw unnecessary attention to specific foods that you might think your child is not going to like. Sometimes our own dislikes get in the way, and create the expectation that our child is not going to like it either. Our food preferences are formed through previous experiences, which children don’t have. Praising and bribing are commonly used, especially when we don’t expect children to like the food offered, but it can be counterproductive. Instead, serve food in a positive environment but keep your reactions neutral. This isn’t just about what is on the plate, it’s about a relationship with food. So if your children are old enough, let them help in the kitchen. It can be very messy and time consuming, but it is an excellent way to create a positive atmosphere around food. It is also important to have frequent family meals and consume vegetables yourself. It’s been shown that children who eat with family do eat more vegetables. Kids often copy adult behaviours, so set a good example by routinely serving and consuming vegetables. There is sadly no single answer as to what will work for your children, and it might be a case of trial and error. But these actions can create positive associations with all kinds of foods, and you can help your kids lead healthier lives – saving yourself a bit of cash while you’re at it.